November 2012 issue on sale today, in print and online! | What Hi-Fi? November 2012 issue on sale today, in print and online! There's just a month to go before we reveal all our 2012 Award winners across 20 categories, but in the meantime our bumper November issue is out today. It's packed with juicy new kit and a host of potential Award winners, so this is an issue not to be missed. 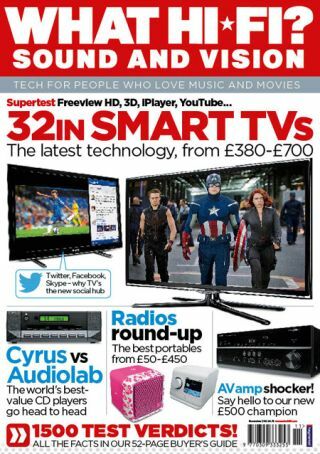 This month's Supertest looks at 32in smart TVs from £380, and they're much more than just simple tellies: we're talking Freeview HD, 3D, BBC iPlayer, YouTube and plenty of other clever tech for sensible money. And (finally!) our long-awaited Group Test of the hot new £500 home cinema amplifiers from Denon, Onkyo, Pioneer, Sony and Yamaha. This really is the sweet spot for anyone wanting to build a dynamite home cinema system, these talented amps packing a mighty punch. Elsewhere we've a Roundup of 10 mighty internet radios, from just £50, and a CD player shootout between Audiolab and Cyrus (8200CD vs Cyrus CD6 SE2). In The Big Question three readers decide if changing the rack your kit sits on can affect the sound. And our First Tests section is crammed with new kit, including a new budget CD player/amp pairing from Cambridge Audio that gives Marantz a run for its money, our first look at Google TV, an exclusive review of the NaimUniti2 and KEF's anniversary LS50 hi-fi speakers, a stonking £100 budget Blu-ray player from Sony and our verdict on the Samsung Galaxy Note 10.1 tablet. Oh, and did we mention the Denon D-M39DAB micro system, the replacement for the multi-Award-winning D-M38DAB, as well as the B&W MT-50 5.1 speaker package and Pioneer SC-LX86 home cinema amp? They're all reviewed in this issue too. We also bring news of the big product launches at IFA in Berlin and the latest improvements to Freesat. Best of all. we've got five pairs of five-star Tannoy Revolution DC6T SE speakers to give away in this month's competition, so head on over to our Competition page to enter. Who knows, you might be one off the lucky winners! All this and more is in the November 2012 edition of What Hi-Fi? Sound and Vision, available from all good newsagents now. And don't forget it's available as a digital edition on iTunes and Zinio to download to your PC, Mac or tablet.